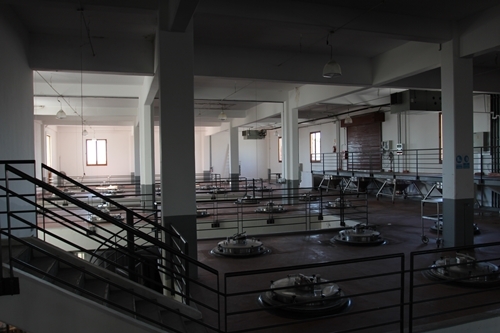 The partnership and project “Clos de los Siete” was formed in 1998. It was initiated by Michel Rolland, and it involves some of the most influential wine dynasties and families in Bordeaux. 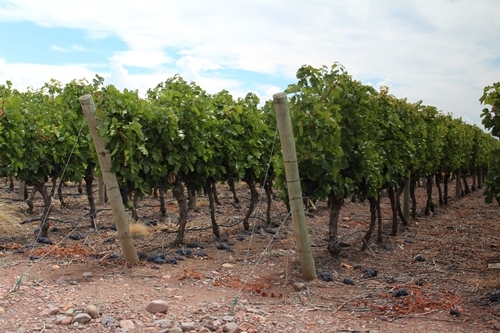 The vineyards and wineries are positioned in a closed society, situated in the Uco Valley just east of Vista Flores, approximately 120 kilometres south of Mendoza City. 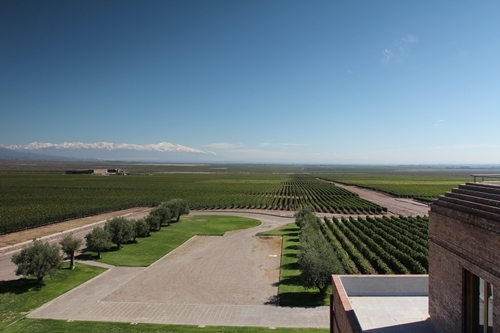 All the partners supply part of their grapes to the Clos de los Siete Wine, which is made at the Monteviejo Winery, here pictured from the south east. 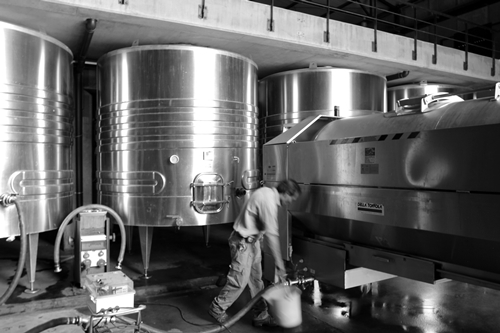 The Winery is owned by the family of the late Catherine Péré-Vergé, who also owned prestigious Pomerol Estates as “Le Gay” and “La Violette”. The Monteviejo Winery is here captured from the nearby DiamAndes Winery. 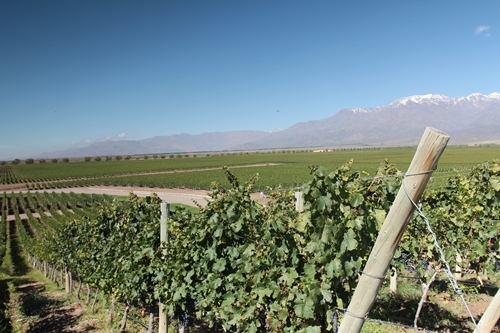 The dark green vineyards are of the grape variety Malbec, and the lighter green vineyards that surrounds the winery are of Merlot. They make several other wines beside Clos de los Siete and are especially known for their Lindaflor Range, which includes an original Chardonnay, an elegant spicy/floral Malbec, and a terrific blend of Malbec, Merlot and Syrah “La Violeta” (the violet). 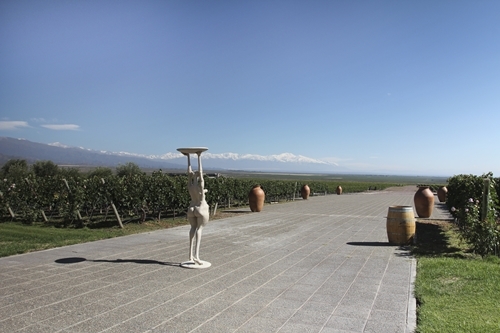 The Monteviejo Winery also host remarkable art and sculptures, as the fertile woman by their north-west facing entrance. 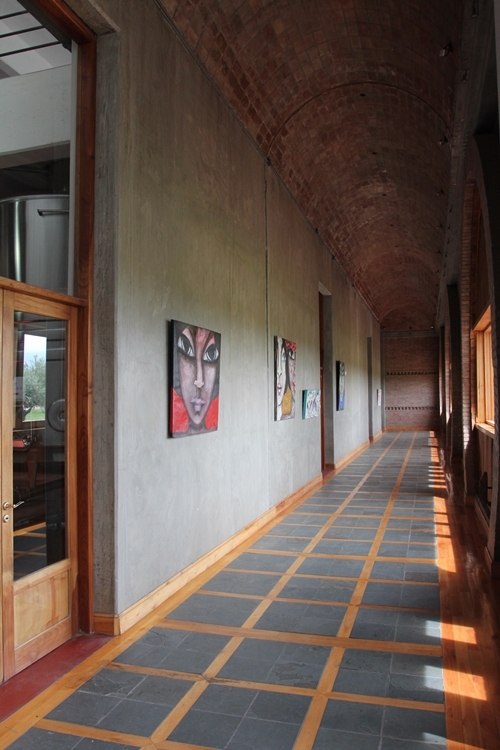 Corridor in the Monteviejo Winery. 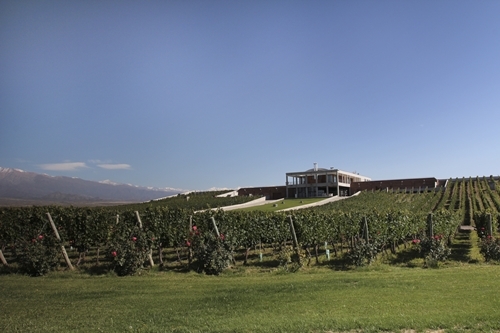 Their west facing rooftop enjoys spectacular views of the surrounding vineyards, Estates and the Andes Mountains. It is found next to their visitor restaurant, which serves excellent takes on the rustic Argentine Kitchen, prepared and cooked in front of you on a wooden fire. 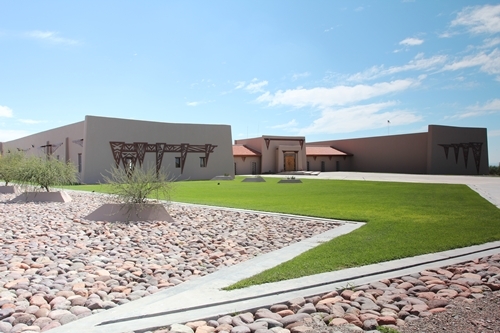 Monteviejo is cleverly designed to gravity flow, and the south east end of the winery is therefore constructed to a road and a raised vineyard that takes you to the top of the winery. 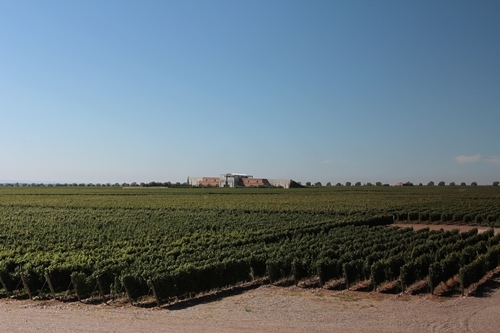 The 5 Estates share a total of 850 hectares of vineyards. These also have a slight inclination, as they are planted at altitudes going from 1000 to 1200 metres from east to west. View towards north-west from the rooftop terrace. The winery seen in the left of the picture is DiamAndes. 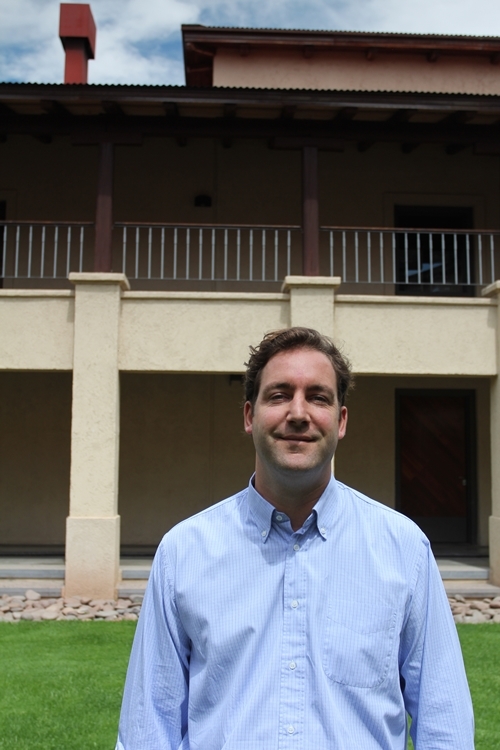 Marcelo Pelleriti is not only Monteviejo’s general manager and winemaker. He is also the winemaker at the Péré-Vergé family’s two extraordinary Estates in Pomerol (Bordeaux) “Le Gay” and “La Violette”. 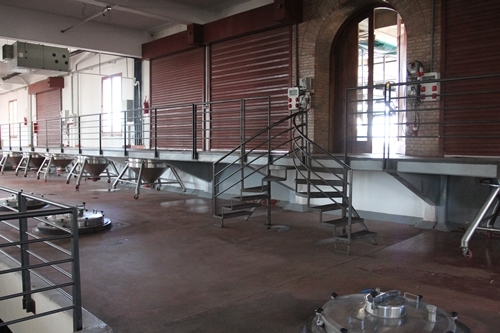 Clever functional architecture makes the winemaker’s life easier. 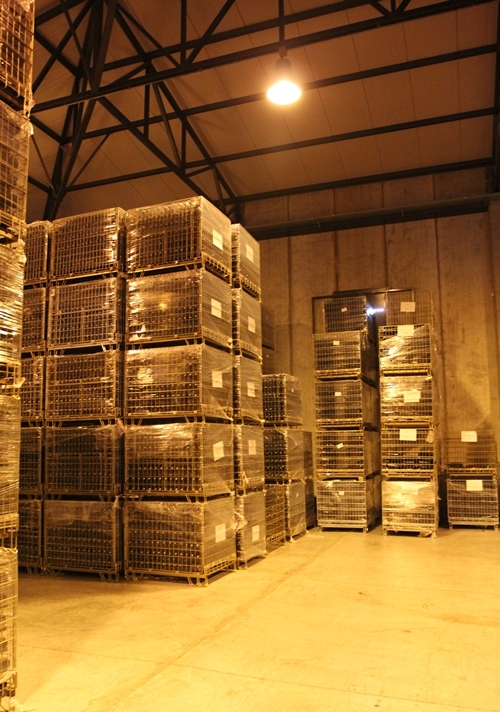 Here the grapes are received and processed, to fill the tanks found on the floor below by gravity flow. The design makes it possible to process the fruit instantly. 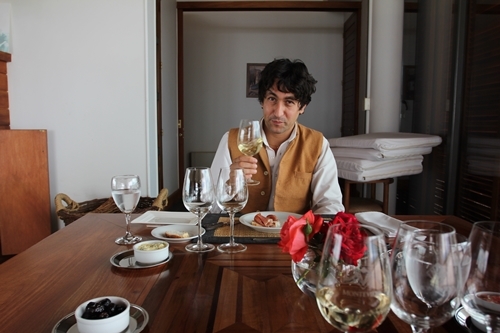 Enjoying lunch and Monteviejo’s wines with my guide for the day, Pablo Molinengo, Hospitality Manager of Clos de los Siete. A charming host, who made the experience superior. 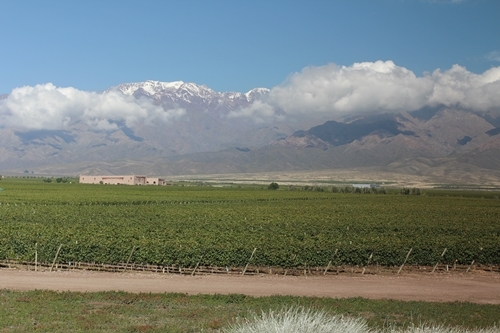 Flechas de los Andes is owned by Baron Benjamin de Rothschild (1) and Laurent Dassault(2). 1. Has a portfolio of estates including e.g. Château Clarke in Bordeaux and Rupert Rothschild in South Africa. 2. is behind e.g. the two Grand Cru Classé Chateaux “La Fleur” and “Dessault” in St Emilion). 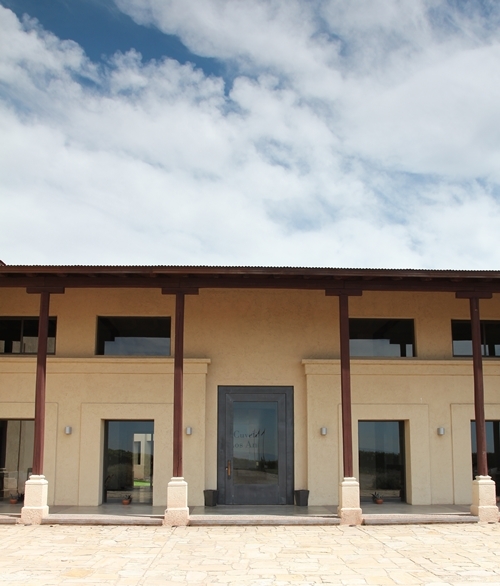 The winery’s remarkable architecture makes it impossible not to notice, even though they no longer figure among the listed wineries on Clos7.com.ar. View from Flechas de los Andes towards the Andes. 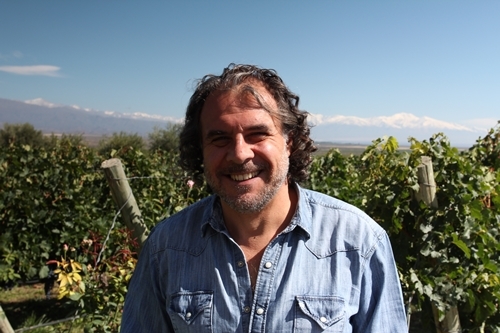 Flechas de los Andes is especially known for the two concentrated wines: “Gran Malbec” of solely Malbec, and “Gran Corte”; a hedonistic blend of their best plots of Malbec, Syrah and Merlot. 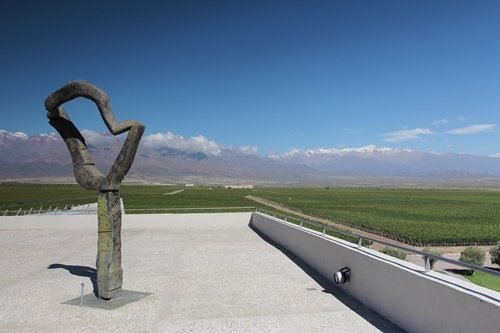 View from the DiamAndes Winery. 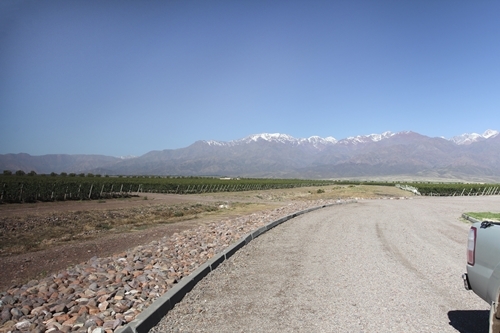 The winery in the left side of the picture is Flechas de los Andes and the grey winery in the right side is Michel Rolland’s own winery “Bodega Rolland”. 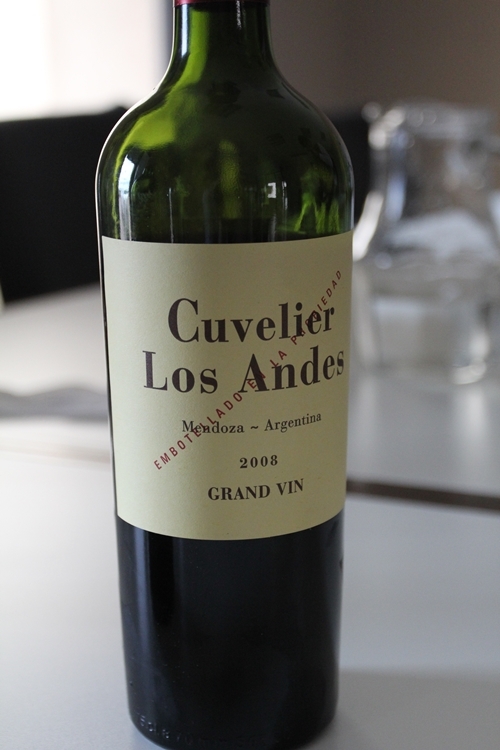 Cuvelier Los Andes might own the fewest number of hectares in the partnership, yet their icon wine “Gran Vin” is among my favourites from Clos de los Siete. The label design reveals their ties to the prestigious Château Léoville Poyferré in Saint Julien, Bordeaux, which the family also owns. 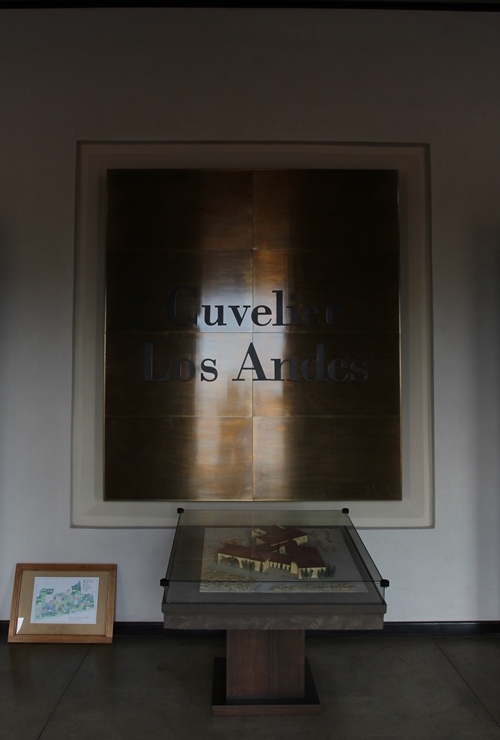 The architecture of Cuvelier Los Andes is clearly the most Argentine inspired, when compared to the other Estates in Clos 7. 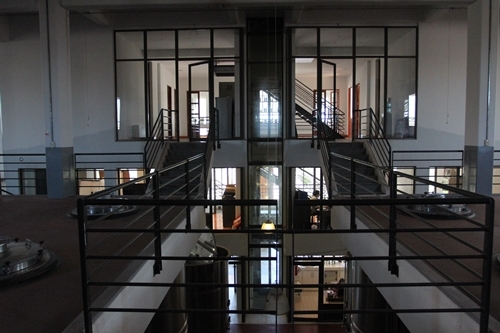 A small-scale model of the Estate is showcased in their lobby. Here the warm and exceedingly pleasant Baptiste Cuvelier. 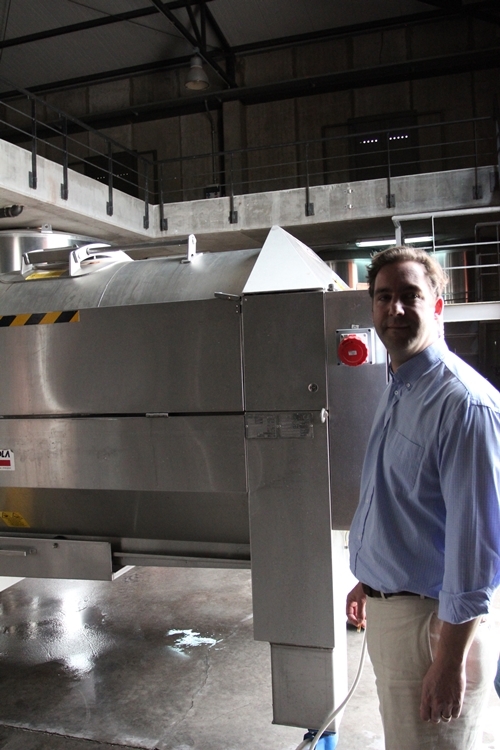 Harvest had just begun at Cuvelier Los Andes, and they were already processing grapes during my visit. Baptiste Cuvelier by their Membrane Press. Bottle ageing assures that the wines are more accessible upon their release. Here their pride and joy; “Gran Vin”. I have enjoyed the wine several times and from different vintages, which all have been outstanding. The 2008 is the most recent vintage and it is a blend of 65% Malbec, 15% Cabernet Sauvignon, 10% Syrah, 5% Merlot and 5% Petit Verdot. It is a multi-layered wine, well-structured and with a balance and elegance few wines seem to conquer. Moreover is it priced more than reasonable; giving the wine exceptional value. Real quality demands real sacrifice. A green harvest can seem brutal to some, yet it is a needed sacrifice to attain the proper concentration and depth in the remaining grapes.